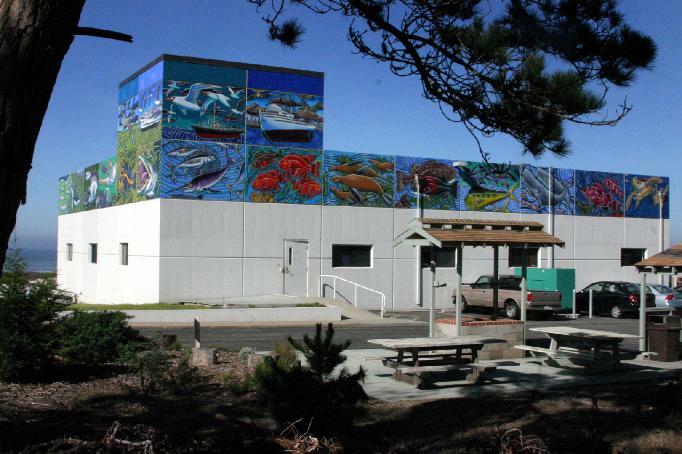 After three years of planning, design and production we’ve finished and installed a 4oo foot long mural for NOAA’s Southwest Fisheries Science Center located in beautiful Pacific Grove, California. Working with scientists at the lab we came up with a theme based on the changing critters of the California current. I designed and drew the 32 panels that surround the building. Roberto Salas and the fastest brush in the west, Guillermo ( AKA Memo) Jauregui, painted each six by eight foot panel down in San Diego. They used acrylic paints on unwoven fabric that was later adhered to the concrete walls of the lab. Check out the o-fish-al NOAA website about the mural at http://swfsc.noaa.gov/pg-mural.aspx. NOAA plans to produce a lot more educational outreach material so stay tuned for more developments.